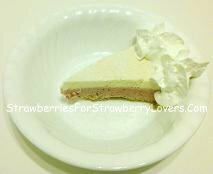 Look here for a virgin frozen strawberry margarita pie recipe, one of many really good, easy, fresh strawberry pie dessert recipes on this site! A strawberry margarita you can eat! This strawberry-drink inspired recipe gives all the wonderful citrus and strawberry flavor you'd expect from a margarita... in a no-bake pie! First, melt the butter or margarine, then mix it with the graham cracker crumbs and sugar. Next, line a 9 inch (23 cm) diameter cake or pie pan with parchment paper, then line with the graham cracker crumb mix (lining the pan with parchment paper is optional, but it will make it easier to remove the finished dessert later). Finally, to finish preparing the crust, set it in the refrigerator to allow it to harden. This strawberry margarita pie recipe has two layers that are super simple to make! To make the bottom, orange-strawberry pie filling layer, first puree the strawberries. After that, add the orange juice, then the Angostura (or whatever other orange bitters you might prefer), 1/8 Cup (25 mL) of sugar, and 3/4 Cup (180 mL) of heavy cream, and mix everything thoroughly. Pour this filling into the pie crust, then set the crust and filling in the freezer and allow the filling to freeze completely. Once the bottom layer of the pie is frozen, it's time to add the top, lime layer. Just mix the lime juice with the remaining sugar and heavy cream, then pour it into the pie crust on top of the already frozen orange-strawberry layer. Put the pie back into the freezer and allow this top layer to freeze, too. And that's it... that is all that's required to make this outstanding dish! The pie can be stored frozen for 8 months to a year. Keep the pie frozen until about 10 to 15 minutes prior to serving (the exact time depends on how warm the air is in the place where the pie will be eaten). The pie is sufficiently thawed for serving just as soon as it can be sliced without difficulty. Garnishing each slice with a sprinkle of large grain salt (optional) will further increase the resemblance of the pie to the drink, both in flavor as well as overall experience. A bit of whipped cream may be used for garnish as well. Here's a slice of this really good, fresh, crust-recipe strawberry pie! Enjoy one of these strawberry treats soon! 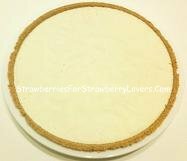 And please remember that you learned how to make this strawberry margarita pie recipe here at StrawberriesForStrawberryLovers.Com, Home of the World's Happiest Fruit!